A Lifesaver in Your home --- Let your Save money, time and your sanity in the home and garden, and let adults and children as well as pets away from mice, roaches, spiders, crickets, Bugs, fleas and other Harmful insects or animals, to create a more warm and safe family environmental. 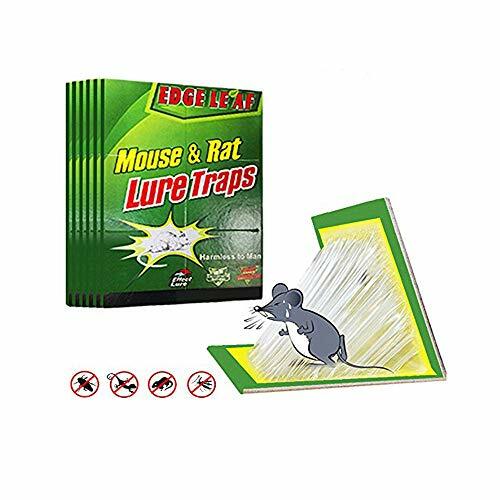 Safe and Easy to Use --- Made of material, safe and non-toxic, just Place it where rats are observed frequently, such as indoor, kitchen, office, meeting room, restaurant, behind appliances, under sink, garage, near garbage areas etc. High quality glue --- Mouse glue is manufactured with peanut butter scented glue, Import strong glue and evenly distributed, can be used all year round, The unique smell of peanut butter is more attractive to mice, easier to catch mice. Durable --- Mouse glue has super hard importing paperboard, low profile of these glue boards allows for easy placement, lies flat or can be folded to protect from falling objects and dust, reusable, heightening knob, prevent glue sticking to each other, increase long-term storage time. Our guarantee --- 100% Satisfaction guaranteed - if you\'re not completely satisfied,we\'ll make it right or your money back. Click \"Add to Cart\" now, Keep Your home and Garden Healthy.